WARNING: THIS POST CONTAINS MAJOR SPOILERS FOR STEELHEART. IF YOU HAVE NOT READ STEELHEART, STOP AND GO READ IT. From the moment I first laid eyes on you, I knew you were as awesome as the last hot-dog salesman in Newcago. The way you took down Fortuity was amazing. You nearly had him trapped with the strength of your charms alone; he was quite beguiled by them. You’re so beautiful even a blind nun would stop to look at you… If she weren’t blind, that is. Regardless, when your plans went awry, you had the ability, with my help, to take him down and rid this world of yet another evil Epic. They say that you are one too of them. You told me that you are one of them. That you infiltrated us like an oatmeal raisin cookie. But I don’t believe them. I think you are a good person. I’ve seen Prof fighting the evil that comes with his powers, blocking it out by not using them. I know it can be done. And I believe you can do it. You’re as strong as an egg you have your whole hand around. You can fight it, you can overcome it. You just have to get away from the Epics, away from the battles, and you need to not use your powers for a while. Trust me on this. I meant what I said when you were dying, Firefight. I love you. You truly are a potato in a minefield. I have been trying to convince the others of your goodness, but even Prof, who should know that your powers, your evils, can be overcome, will not listen to me. I recommend that if you see me with them that you avoid them at all costs. I wish you no harm, but it will take time to convince them of your goodness. Our next destination is Babylon Restored. I have heard that you’re already there, and I hope to meet you on more amicable terms than the last time we met. Haven’t you ever grabbed a chocolate chip cookie, taken a bite, and found that it was oatmeal raisin in disguise? This actually works, surprisingly enough. If you hold the egg in the palm of your hand and wrap your fingers all the way around it, it’s basically impossible to crush. I had a lot of fun trying to write the above letter in David’s voice, as he might be feeling at the end of Steelheart. I don’t know that I succeeded incredibly well, but I enjoyed it. And if it wasn’t clear, Firefight was amazing. Steelheart was a really good book for the start of a trilogy. It bucks a lot of tropes, as is typical with Sanderson’s work, and it introduced us to an incredible cast of characters, Tia, Prof, Cody, Abraham, Megan, and, of course, David. Firefight takes us from Newcago to Babylon Restored, the home of Regalia. If you managed to get one of the exclusive editions of Steelheart with her profile in it, you know a little bit about what’s coming; if not, I’ll just say that it’s awesome. You need to read Steelheart before you read Firefight. The events of the bridging novella, Mitosis, are mentioned a few times, and play a minor, but important role in one of the plot points of the book. You can, however, get away without reading it, and you’ll be fine. There’s a lot of new characters that we meet, including another Reckoner team and several new epics for them to pit their powers against. I’m not going to spoil any of the introductions, because they’re truly delightful, but I will say that I really, really liked one of the new characters, and the way she was introduced/described. The plot starts off in a very similar manner to that of Steelheart: There’s a chilling prologue, then a fight with a minor epic, and then the team heads out to start planning their main mission. Like Steelheart, the entire book is a ramping up of the tension, with a really intense pacing that never loses track of the essentials of the plot and the overall goal. But the epics are bigger, the stakes are higher, and the secrets more surprising. When you get to the last 70-100 pages, you have to be able to read it all at once. it’s an incredible experience that you really just have to experience all at once. As you may have guessed from the letter, I actually ship David and Megan. I’m not usually a shipper type person… In fact, I’m usually the opposite. I want minimal romance and I certainly don’t want it to distract from the plot. This one, though, is just so… Perfectly right. I can’t deny that, at the end of Steelheart, I was so excited that the next book was titled Firefight, and that I had really high hopes for Megan and David. I’m not going to say if these hopes are realized or not, but… Yeah. I ship them. I think it’s largely because David is so adorably nerdy and is trying so hard to do the right thing, but he’s not superhuman or blessed with any incredible powers, and Megan is the perfect foil for him, as well as being a very exciting “grey” character. And the twists are huge, especially near the end. I thought I was prepared for the Sanderson ending, but no… It was utterly amazing and brilliant. So many moments when I had to stop and put the book down to try to process the epicness (pun intended) of what had just happened. One last comment to tell you how good it was: I read this book in the middle of the school semester from hell, where I had two 20+ hour projects each week plus standard homework in two other classes, and I barely kept up with all of it. I read Firefight in one sitting the night I received it, finishing around 3 AM after I had been awake at 5:30 AM the previous day and in class essentially 7 AM-7 PM. And I do not regret it. Firefight is the rare book where the author not only matches the first book in the trilogy, but exceeds it. 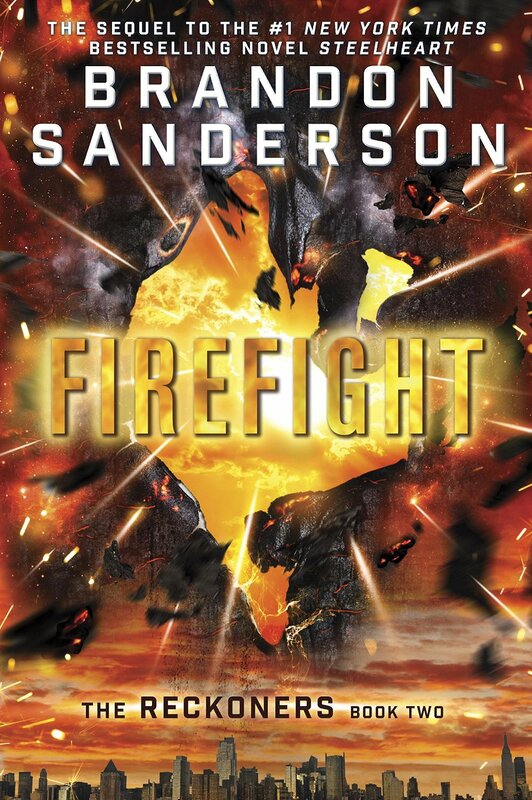 Apparently nobody gave Sanderson the note that second books in trilogies are supposed to be boring bridging material, because Firefight is packed with 100% pure awesome all the way through. Verdict: 5 of 5 stars, because there aren’t more than five, and GIVE ME CALAMITY! Brandon Sanderson’s Website (With awesome Firefight theme.). THIS LETTER TO MEGAN IS MY FAVORITE THING OF ALL TIME! I ship them so hard! I agree that Megan is the perfect foil for David. I also think that their relationship reflects his feelings on Epics which has been evolving and changing throughout the series. Also I was definitely not prepared for the twists in this book and there is no way I will be prepared for the ones in Calamity. That book is going to be so, well… EPIC! Yay, I’m glad someone read and enjoyed the letter! I’m rereading right now, and I’m shipping Megan and David SO HARD.